Belle passeggiate bush e costiere dal lotto. Splendide spiagge per il nuoto nelle vicinanze. 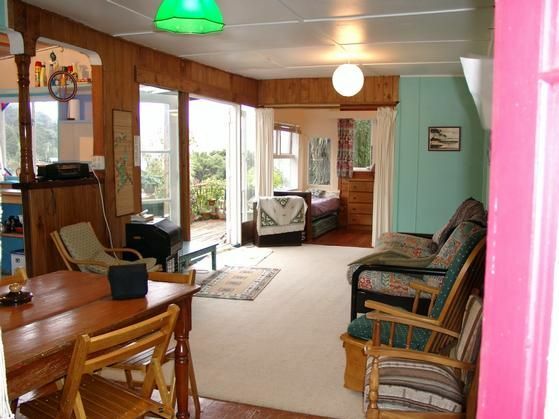 Questo cottage è il luogo ideale da cui partire per esplorare l'estremo nord della Nuova Zelanda, a metà strada tra i villaggi di Kerikeri e Kaitaia, a breve distanza da una spiaggia di 90 miglia e da Cape Reinga Doubtless Bay a due passi dallo spettacolare porto di Whangaroa. Goditi la tua esperienza di kiwi bach! bach disponibile ora ora e discutere le vostre esigenze! This place is unique and we loved it. Our favourite place we stayed all holiday. We loved this Bach. It is so unique and it has such soul. It has everything you need. Our little baby had great fun playing with all the toys and books. You really feel like you are up in the tree canopy. We also loved the area itself. It’s so beautiful. This place is definitely worth a stop off. Also Steve was so helpful in the lead up to our stay and was lovely to meet him and Veronica. The house was unfortunately not very clean, as one of my guests said if this was in Australia we would be leaving due to the place being covered in spider webs but lucky we don’t have things that bite here. Took our own bedding thankfully because one of the beds had flanalette sheets in the middle of summer. Despite being bitten by mozzies we did have a good time and coppers beach is stunning. Authentic iconic Kiwi Bach, took me back to my childhood spending time at my grandparents bach. Everything you need without the frills. Outdoor toilet and all. Would definately recommend for the nostalgic. Lovely tranquil spot. Lovely, quirky, homely. It was hard for us to leave the peace of this place in Mangonui to go back to our city lives. We really loved this Bach. We really loved this Bach. Lots of beds if you want a few people to stay. L'indirizzo è 40a Mill Bay Rd. non 18a!